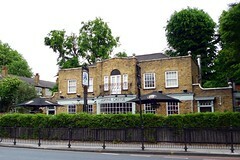 A pub with a large garden out front, in Canonbury, formerly known as the Alwyne Castle but later signed as the oddly-punctuated "The Alwyne.." (though according to the Pubs Galore link below, as of May 2011 it's back to being the Alwyne Castle again). It's owned by Mitchells & Butlers, and one of their Castle pubs. The most prominent feature is the extensive seating out the front, along St Paul's Road. Some of this is shielded from the traffic by a tall hedge of bamboo, and cover is available over many of the tables, but seating extends into an adjoining open area which still looks like a former car park. In either area, it still gets pretty noisy from passing traffic. There's a BBQ area out front as well, and operating on busy summer evenings and weekends (you need to order food from the bar first, though). Inside are couches and small tables, with a separate dining area in a room at the back. Food is served noon-10pm daily, and from 10am on Saturday, and is a pretty standard menu. Ewan tried the sharing vegetarian platter (£8.50), which came with plenty of variety (thick-cut potato wedges, falafel, hummous, grilled halloumi cheese and the like), and was a reasonable size and quality photo. The bar has plenty of drink options, as is now standard for this chain of pubs. There are four ale handpulls, with Pedigree, Black Sheep Bitter, London Pride and Old Rosie scrumpy. Draught taps dispense Sierra Nevada, Leffe, Früli, Staropramen, Peroni, Heineken, Hoegaarden, Red Stripe, Budvar, Beck's Vier, Grolsch, Franziskaner and Foster's, as well as Bulmers, Addlestones, and Aspall ciders. It's a reasonable place, but predictably gets busy on warm days after work, and even on a summer Tuesday in June 2009 was fairly thronged with people outside in the evening. It apparently also gets busy when there are Arsenal football matches on. Accessibility: There are steps as well as a ramp to get in, and a separate accessible toilet. Last visited by Ewan, 8 January 2010. Opening hours and food times taken from website, July 2009. Last edited 2013-06-06 12:34:18 (version 10; diff). List all versions. Page last edited 2013-06-06 12:34:18 (version 10).